Email Marketing continues to be one highest return delivery methods across all of digital marketing. With the Chainlink Marketing Platform, you can deliver automated, intuitive, dynamic with the appropriate 1:1 messaging that the modern customer or prospect deserves. No more set, forget and blast to irritate your loyal followers. You’ve already done the hard work to attract leads and prospective customers, so reward them with beautifully designed emails that are truly personalized. Given how much of modern communication is driven through email marketing, the Chainlink Marketing Platform ensures that you’re getting the most out of every touchpoint. Using our intuitive email builder, even an email marketing rookie can craft beautiful email campaigns that drive engagement, conversation, and most importantly, conversions. Our email marketing tools provide easy-to-use templates that you can save and alter with custom design options. This way, every marketer on your team can effortlessly integrate their own brand elements and content into every email marketing message. Chainlink Marketing Platform Email Marketing tools empower users to craft the perfect communications that can be dynamically updated with personalized content, and triggered automatically based upon specific interactions, whether that be a customer visiting a webpage, filling a form, or opening/ignoring a previous message. You can also pre-program your marketing messages to be sent at a specific date and time in the future, allowing you to set your marketing schedule and interactions far in advance. Also, your email marketing can be adaptive, updating dynamically based on prospect and lead engagement, driving the most effective drip and nurturing messaging possible. Chainlink Marketing Platform’s advanced tools allow you to create the perfect messaging to drive the highest engagement possible through A/B testing; send separate subjects, messages, or CTAs and let your audience decide what’s best before going with a winner to the rest of your audience. Our email marketing tools also provide email previews and preventative SPAM scoring, as well as powerful delivery. And of course, you can monitor all of your emails to see how your customer, leads, clients and prospects are interacting in real time. Chainlink Marketing Platform makes it simple to easily verify your Domain using a simple DKIM process that only takes a minute. From there you can send emails that look like they’re coming directly from your inbox. Depending on the type of messaging and program, you can program emails to come from specific salespeople, a general inbox, or yourself. Messaging can be dynamically driven based on the last contact your target had with your company, further deepening your relationship with your customers. Chainlink Marketing Platform makes it easy to create automated marketing flows using our intuitive Drag & Drop tools. Program conditionally triggered emails and dynamic web pages that can be deployed based upon any single (or combination) of actions (or inactions). A customer bought something from your store? Great, automatically enter them into a life cycle campaign. Did a target visit your website but not pull the trigger? Set an automated nurturing drip campaign to bring them back and provide relevant buyer information, further enhancing the value of your offering and company to the customer. Create and craft dynamic flows with as many, or as few, conditions as you want, and let the automation do the work for you. Chainlink Marketing Platform’s Drag & Drop WYSIWYG (What You See Is What You Get) tools you can move, add or delete different elements from pictures, to dynamic variables that will be personalized and updated for every single target involved in the marketing program. Our tools make it simple to create targeted and sophisticated marketing programs that are customized for every target, using visual elements and rules. We also provide hundreds of starting templates in case you don’t want to start from scratch, you can simply replace with your brand, colors, and messaging. Chainlink Marketing Platform allows you to craft, design, and implement multi-channel messaging programs, without any previous technical training. Using our visual tools, create multi-step programs and campaigns that are reactive and dynamic, with automated steps. Using the Chainlink Marketing Platform tools, you can start a multichannel campaign with multiple automated triggers that send variable messaging depending on how targets interact (or don’t) with all previous efforts. And our tools make it simple to set up these complicated efforts in minutes. Chainlink Marketing Platform realizes that sometimes creating new material sometimes requires some inspiration. Chainlink Marketing Platform helps out by providing hundreds of Responsive Templates that you can simply replace, edit, or add your personal elements from your offers and branding to execute new email programs in minutes. Every one of these templates is responsive, meaning it will open and read properly across all devices, browsers, and email clients. 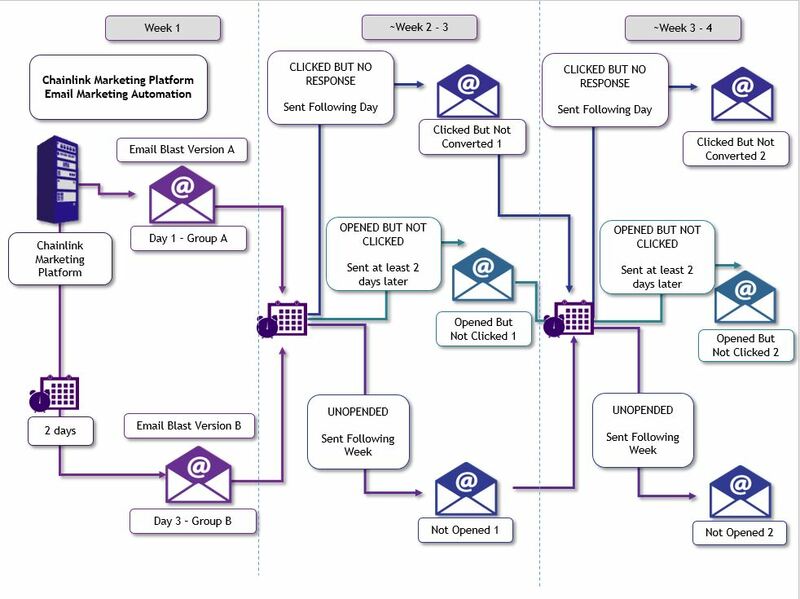 Chainlink Marketing Platform allows you to create automated emails that are “Triggered” or enacted when a target takes a specific action (or inaction) or based on any combination of behaviors. For example, if a customer buys something, they “Trigger” an automated series of Thank You and Informational Emails. Get even more sophisticated, because Chainlink Marketing Platform has custom lead scoring and tracks every single website and form visit, if one of your targets visits your site a predetermined number of times, deploy a stronger offer or discount to encourage purchases. Customize these triggered cross-channel programs to align with all of your marketing goals.